Please enjoy this selected article (April, 2015). The gist of the story is that this sweet little girl, Annabel, was climbing a tree when a branch broke, causing her to fall head first, thirty feet into a hollow tree, where she was stuck for five hours. It’s unclear from the reports I’ve read whether this was actually a near death experience, the reports mentioning only that she was “unconscious” at some point (this is when she supposedly “went to Heaven”), and that she was rescued without injury. Additionally, Annabel had suffered for years with a very serious intenstinal disease, and after her accident, became asymptomatic. These are nice people. Sincere people. The kind of people I’d probably be friends with if they went to my church. And they have nicely, sincerely, and with the best of intentions fallen into what I think is the number one theological error facing Christian women today, namely, believing and trusting in human experience over God’s word. Now, I don’t doubt the facts of this story: that Annabel had a dangerous and frightening accident, that she lost consciousness and had some sort of experience before awakening, that she had a serious intestinal disease, and that, in God’s perfect timing, He chose to heal Annabel shortly after this tree accident. And the reason I don’t doubt any of that is that it is all based in verifiable fact (unless someone comes forward with documented evidence to the contrary) and none of it conflicts with God’s word. But an actual “trip to Heaven”? That’s not based in verifiable fact and it does conflict with God’s word. If you feel upset with me right now for saying that, I’d like to ask you to examine why that is. Why are you upset? On what do you base your belief that this child (or anyone else outside of documented cases in Scripture) has actually made a real trip to Heaven and come back to tell about it? Her say so? This child was nine years old when this happened. Nine. Colton Burpo (Heaven is for Real) was three. Alex Malarkey (The Boy Who Came Back from Heaven– which Alex has been recanting for years) was six. Have you ever spent any time talking to a nine year old, a six year old, a three year old? A lot of them will tell you they believe in Santa Claus and the tooth fairy, or that they have an imaginary friend, or that they’re a super hero. They’re very sincere and they aren’t lying, but they’re also very wrong because their beliefs are not based in fact and are strongly influenced by their immaturity. So why are we so quick to believe, based solely on their own say so, that the experiences these children had while unconscious were actual trips to Heaven? For the same reason we love chick flicks and fairy tales and Hallmark movies, ladies. These stories appeal to our emotions. They make us feel good just like a rich piece of chocolate on a stressful day. And when you slap the “God” label on a story of childlike wonder coming out of a nice Christian family, our belief not only makes us feel good, we also feel justified in believing the story. And God’s word says that kind of mindset is not for strong, discerning, godly women, it’s for weak women. But understand this, that in the last days there will come times of difficulty. 2 For people will be lovers of self, lovers of money, proud, arrogant, abusive, disobedient to their parents, ungrateful, unholy, 3 heartless, unappeasable, slanderous, without self-control, brutal, not loving good, 4 treacherous, reckless, swollen with conceit, lovers of pleasure rather than lovers of God, 5 having the appearance of godliness, but denying its power. Avoid such people. 6 For among them are those who creep into households and capture weak women, burdened with sins and led astray by various passions, 7 always learning and never able to arrive at a knowledge of the truth. When we hold these “I went to Heaven” experiences (whether from children or adults) up to the light of Scripture, they crumble, from Hebrews 9:27, to the descriptions of God, Jesus, and Heaven that clearly contradict Scripture (and the descriptions from other people who supposedly went to Heaven and came back), to the sufficiency of Scripture, to the stark difference between Paul’s and John’s scripturally verified trips to Heaven and the trips being taken today (interestingly, Paul was stricken with a “thorn” after his trip to Heaven “to keep me from becoming conceited because of the surpassing greatness of the revelations” while Annabel’s healing is being offered, in a whirlwind of publicity events, as proof that she went to Heaven), to the fact that the Bible doesn’t say anywhere that this kind of spiritual experience is valid or appropriate for Christians today. The people who claim to have gone to Heaven had some sort of experience while unconscious, no doubt, but if they say that experience was an actual trip to Heaven, they are either mistaken or lying. It could have been a dream, a hallucination, an experience initiated by demons (let’s not forget that Satan was once an angel and continues to disguise himself as an angel of light), or a lie they’ve concocted, as was the case with Alex Malarkey. Yet, for some reason, Christian women, who, if asked point blank, would say that they believe the Bible is our ultimate authority for Christian belief, plunk down money for these books, movies, and other accessories, and eat these stories up with a spoon without ever engaging their brains and checking these supposed eyewitness accounts of Heaven against Scripture. But “heavenly tourism” stories aren’t the only area in which we’re choosing to believe someone’s experience over Scripture. Do you follow someone like Joyce Meyer, Beth Moore, Priscilla Shirer, Christine Caine, Lysa TerKeurst, or Paula White? These women all say that God “called” them to do what they do, which includes preaching to and instructing men in the church setting. Do you believe them when they say God “called” them? If so, you’re believing their supposed experience over the crystal clear word of God in 1 Timothy 2:12-14 (and plenty of other passages) which expressly forbids women from instructing men in the Scriptures or holding authority over men in the church. And even putting aside the false and unbiblical doctrine these women teach, how many times have you heard one of them begin a sermon or teaching – not by reading God’s word and accurately teaching what the Bible says- but by telling a story about how God ostensibly “spoke” to them, acted in their lives in some way, or sent them a dream or a sign, and then basing their teaching on that experience rather than on God’s word? If you heed that kind of teaching, you’re believing their experience, not God’s word. What about when it hits a little closer to home? You know God’s word says that homosexuality is a sin, but your 20 year old comes home and announces he’s marrying his boyfriend. So you just throw out that part of God’s word in favor of a happy experience with your son. You defend your right to swear like a sailor despite what God’s word says to the contrary. You “feel” that it was just fine for you to divorce your husband because you fell out of love with him, even though that’s not a biblically acceptable reason for divorce. Ladies, if God’s word says it ain’t so, it ain’t so, no matter what you or I or anyone else experiences to the contrary. And it doesn’t matter how real or vivid or intense that experience was or how right or godly it seemed– God’s word, and God’s word alone defines reality, truth, existence, right and wrong. And we’d better get with the program and submit to its authority. 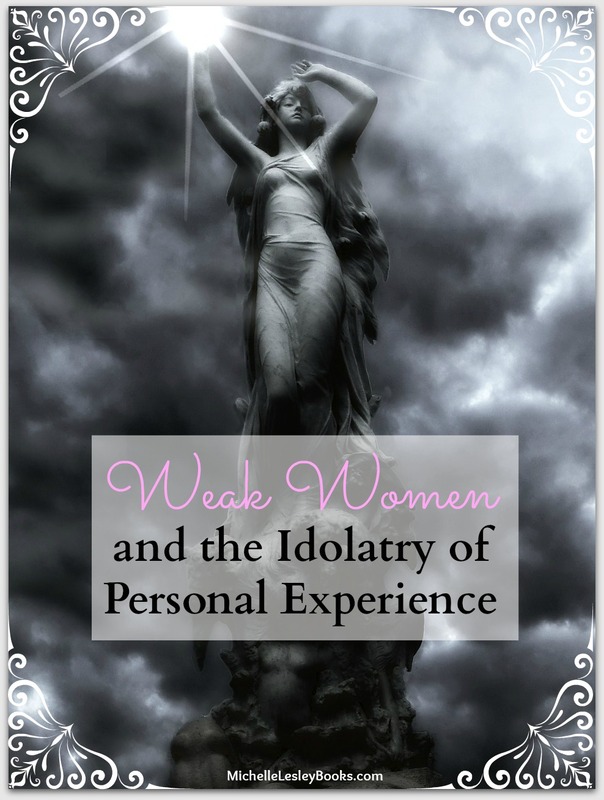 If not, well, I guess we’ll prove the truth of what Paul said by choosing to be those women he talked about: weak, burdened with sins, led astray by our emotions, and always learning yet never able to arrive at a knowledge of the truth. God doesn’t want you to be weak. He wants you to be a mighty woman of His word. 90 Minutes in Heaven on the Big Screen?